Those are the brands that didn't fit into other categories. Some time around, we'll give them their own sections. On this shelf we can find Russian, English, Swedish, Norwegian, German, French and Italian mics. Often, quite a uniques. Despite the appearances, right here you can find the most interesting and rarest items on the market. You're assuming maybe, that here is really nothing interesting to see? You're dead wrong. 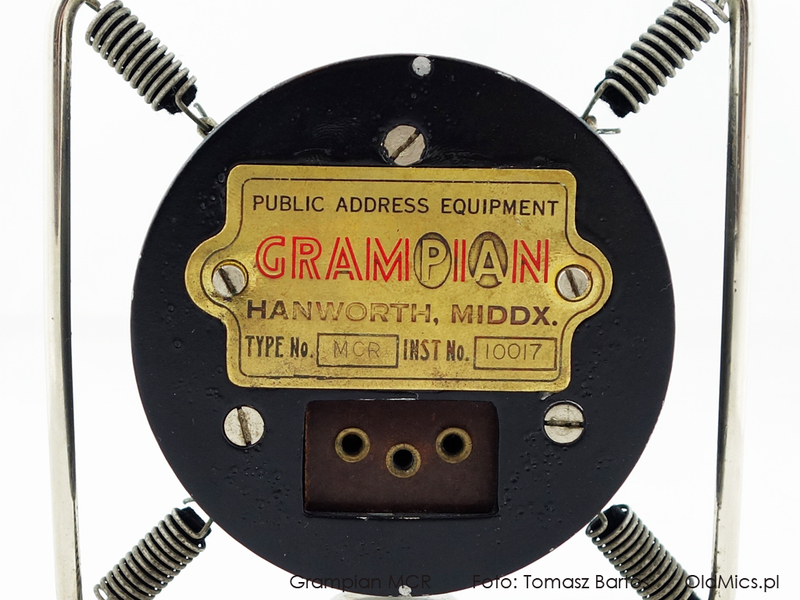 Take a closer look on Grampian, Oktava, Oben, Bruel & Kjaer, Ronette, Siemens, Bang & Olufsen designs. Here you can find models for domestic use as well as professional. Not to mention some vintage gems. Piezoelectric microphone from English manufacturer that we don't know much about. It's made of metal and its shape is adapted to being handheld. Apart from the logo, it doesn't have any labels with the model or series. Connected with a flexible cable with an XLR connector. Works well. Another Acos. This time we have found the symbol and serial number on the base. Probably... Correct us if we're wrong. Piezoelectric microphone, wholly made of plastic. The cable with a jack connector. The twin brother of Telefunken structure with the same designation. Plastic dynamic microphone with gold-plated grill. In the lower part of the body - the socket for the tripod. On the back side - unusual, three-position switch music/speech/telephone effect. All in excellent condition, complete with the manual and the box. Din 3-pin cable. Exceptionally sturdy, 100% metal AEG microphone model from the 1960s. A plastic switch in the upper part. A socket of a kind unknown to us on the back wall - with three pin holes. Elastic cable with a three-pin DIN plug. Preserved in excellent condition and, as every Bang & Olufsenm product, characterized by top quality craftsmanship. 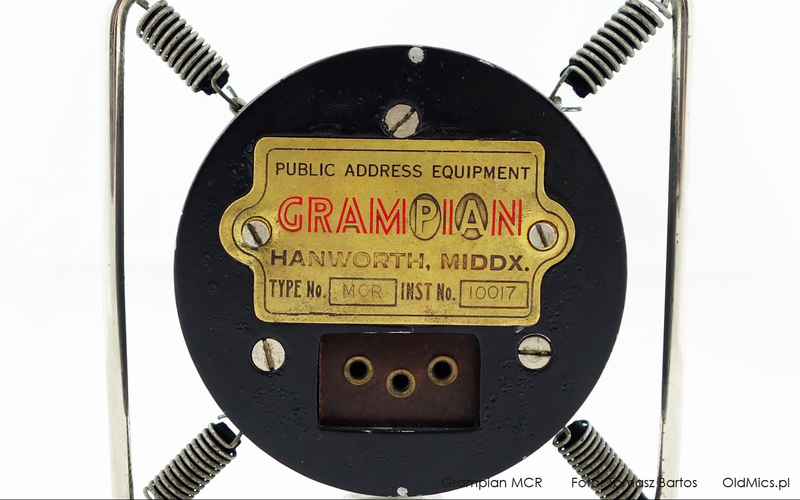 Wholly made of metal, stereophonic ribbon microphone. It is possible to disassemble it into two independent parts. The upper part is set on an adjustable ring for setting the stereo base. The speech-music switch and the silencer complete the full picture. A French dynamic microphone used for stage and in the army. It was sold in a set with a high and conference stand. We have the latter. A sturdy metal base, switch on the body. Very good condition. Highly sensitive and maximally linear microphone by a Danush company Bruel & Kjaer, currently known as DPA. Used in volume measurements in industry, services and in studios. Still sought after and used. Packaged in little wooden box. Complete with a calibration document and bandwidth chart. It needs a suitable preamp to work. A small-sized piezoelectric Funkwerk Leipzig microphone made entirely of metal. Made in the 1950s. Quite common in auctions. The cable ends in a 3-pin DIN plug. 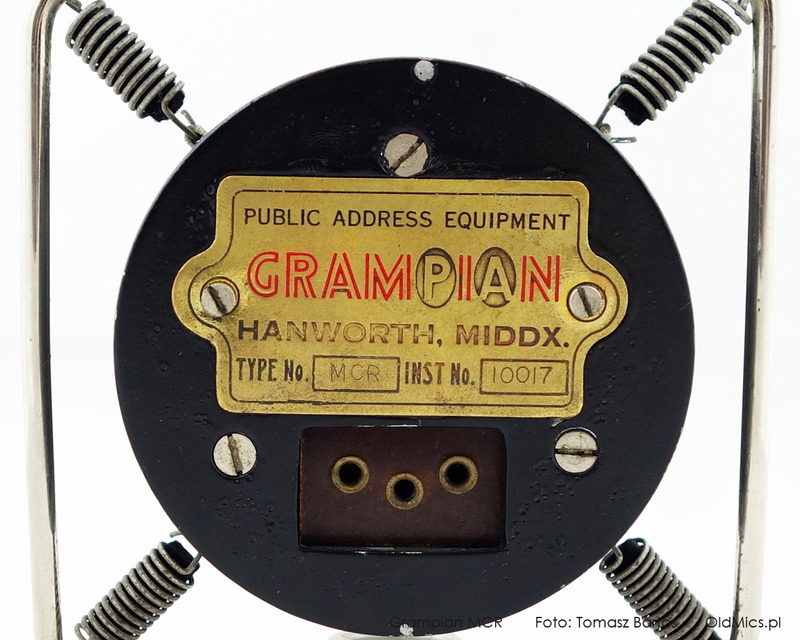 The microphone comes from eastern Germany and probably was sold in a set with part of the audio equipment of the manufacturer. It is in a very good condition. DIN cable. We were unable to find more information about it. One of the most beautiful microphones in our collection. Excellent condition, designed both for industrial and musical environments. Great looks, relatively rare at auctions. 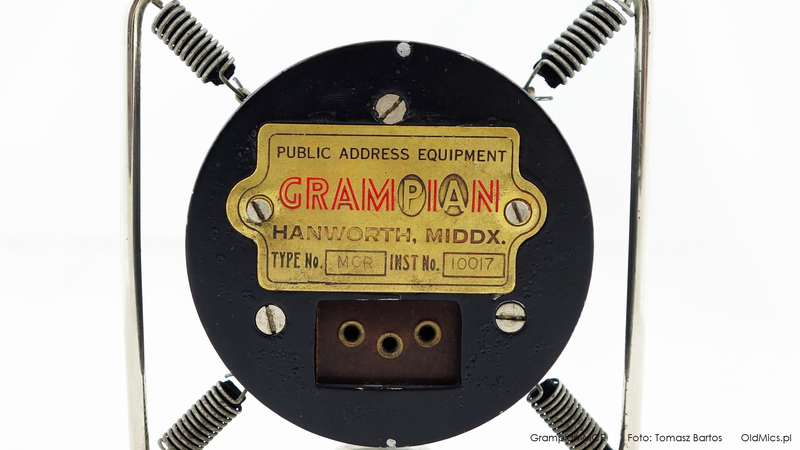 An enormous dynamic microphone entirely made of metal equipped with a solid transformer manufactured by Henry Radio. Set on a heavy cast-iron base. A clone of the SM 8F model manufactured in the years 1937-1941 by Siemens & Halske. A popular plastic design, this time by the Hornyphon Company from Vienna. We have two identical copies in our collection branded as Uher and AKG. There is a tripod socket in the lower part of the body and a speech/music switch on the back. 3-pin DIN cable. A simple plastic dynamic microphone from the Austrian company Hornyphon. A clone of the Philips microphone with the same designation. Cable with a 3-pin DIN connector. Good condition. A microphone identical to Grundig GDSM 331 and the Polish Unitra MDU 24. Stereophonic and dynamic. As usual in the case of Loewe, no number or model name present. A dynamic studio microphone made in Paris in the 40’s. One of the greatest rarities of in our collection. It is very well preserved. The set includes an original plug with three pins. A handle makes it possible to support it on a stand. We know little of this microphone. The name Merula is used interchangeably with Schumann and Ronette brands, which suggests a Dutch origin. Our microphone, however nicely preserved, has a replacement cable installed. Any information welcome. A rather unwieldy plastic microphone by a German company Neckermann. A hole for mounting on a stand at the bottom. A DIN plug. No further information available. A stylish Oben microphone from the 1930s. This item is in very good condition. Worn-out suspension rubbers needs replacing. Unfortunately, our microphone has no support. A stereophonic microphone made by a Russian manufacturer. An original, quite heavy and solid structure. The set includes a metal stand enabling control of the position in 3D. A cable ended with a five-pin DIN plug. We recommend our meme with this microphone: here. A dynamic microphone from the Russian Oktava brand. Entirely made of metal, set on a base made of the same material. Our specimen comes from 1971; it came to us in perfect condition, in a box with an original seal. A studio, dynamic microphone with super cardioid characteristics manufactured in 1979. Wholly made of metal. The original version has a plastic base. We only got a handle which allows for installing it on a tripod. 3-pin DIN connector. A dynamic microphone, often used in the Russian army. The exact date of manufacture is 1977. Made in the Soviet Union. Made of plastic, embedded in a plastic base allowing vertical and horizontal adjusting. A DIN plug, three pins. A very nicely made Paiker Acoustic model. It is set in an ingenious manner by means of a ball socket on a plastic base. After taking it off we can set the microphone on a stand. The name of the model is missing at the front. The cable with a 3-pin din connector. Polish microphone made in the 50’s. A plastic structure with a gold-plated grill, visually very similar to the German Grundig GDM 11. The cable is ended with a three-pin DIN plug. The product of Polish work cooperative Piezoelektronika from Tychy draws attention with, among other things, its colour. As it appears from the manual, in addition to the pistachio, there are still 8 colours to choose from. We have the brown and the white versions. The microphone is all in plastic, with showy gold-plated grill. The twin brother of GDM Grundig 11. 5-pin socket. A twin brother of Grundig MD5 and Labor MD5. Manufacturing date established by guesswork. Not much information available about this company, we’re still looking. The microphone has a rather untypical, green-coloured cable and an odd plug, which looks a bit similar to a 1/8” jack. At a glance, the microphone looks as if it had a military application. It would perfectly suit a tank :) A simple, solid design, heavy, bulky and lacking in subtleties. Originally mounted on a different kind of leg. No other information available, manufacturing date was established by guesswork. The second Piezo MX3 model in our collection, this time on an original base and in a blue-grey colour. Set on a solid base, quite big and completely made of metal. Cable without the original connector. A metal microphone from the Norwegian Proton brand. Unfortunately, we do not know the model. It was apparently sold with a tape recorder. The design is encountered quite rarely. A tripod socket in the lower part of the housing. An unoriginal connector at the end of the cable. The Italian dynamic microphone is from the sixties. Built entirely of metal, heavy and solid (about 500 g). The on/off switch fixed in the body. The fastening socket on the tripod, connection by small Tuchel. The piece is in excellent condition. Entirely metallic body. A braided cable ends in a 1/4” jack plug. Date of birth established by guesswork. No information about the Recordio company. Model unknown. This item is in quite good condition.